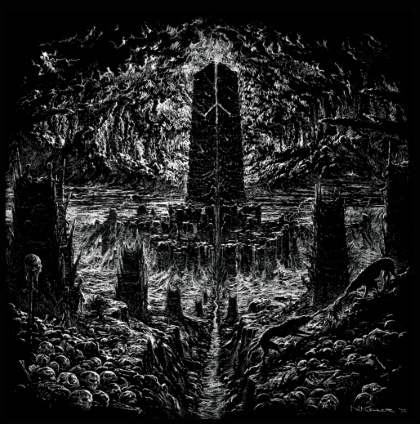 Much in the same vein as fellow black/death acts Portal and Abyssal, Heresiarch attempt to create abstract metal but without any regard for audience enjoyment. The songs are imposing and inspire an unsettling feeling of chaotic vertigo. there is a complete breakdown in songs like “Endethraest” and “Abrecan.” The entirety of Wælwulf resembles more of a dark experiment which illustrates how far one has to remove order before falling apart. In fact the only semblance of order seems to be the segmented tracks which connect these three songs. I spent so much time coming up with analogies, I am wondering whether or not I enjoy listening to this. Heresiarch works best in small stints. Wælwulf is 13 minutes but it will stop time and sometimes feel like hours of maddening labyrinths. Again, the analogies used could be enjoyable for those interested in music which lies on the outside of convention. In the spectrum of heavy metal there are surprising tiers which even veterans struggle to traverse. Heresiarch may just be so far down in the darkness that people will lose their footing and fall into horrid blackness. Maybe that is enjoyable. I do not think I found much joy during Wælwulf but I can say that at least it was a memorable. It may also be great reference point in the ability to provide new dimensions in heavy music.